Champions and Summoners of the League of Legends! Take notice that on Saturday, the 27th of September, 24 CLE, the Serene Realm of Ionia and the Maritime Republic of Bilgewater shall meet upon that Field of Justice called Summoner’s Rift, there to contest by force and arms the question of who shall be permitted to lead the initial aerial survey of Nyroth, to be conducted by Piltovian airship or Zaunite zeppelin. 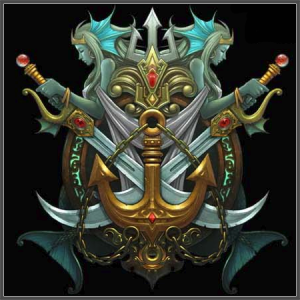 It has long been proverbial wisdom that Ionian poise and restraint, exemplified perhaps by the ninja, is inherently inconsistent with the wild self-indulgence that typifies Bilgewater’s piratical population. Pirates and ninja simply do not get along. The League will soon dispatch an airship expedition to briefly survey Nyroth. It had determined that two Champions and two Summoners should lead the expedition together, one such pair from Ionia and one such pair from Bilgewater. (Not only are both performing well on the Fields, but the Council determined that Ionia’s arcane sophistication would be useful in surveying an island said to be full of strange new magics, and that likewise Bilgewater’s rough-hewn aptitude for exploration would be valuable when traveling to uncharted territory.) But there is a problem: the two factions refuse to cooperate, each insisting on sole authority over the expedition. Growing weary of the arguing, the Council has decreed that this matter shall be settled on the Fields of Justice. Whichever faction is victorious on this 27th day of September, 24 CLE, shall be granted the exclusive right to dispatch a Champion (chosen by a lightning poll after the matches) and a Summoner (randomly selected from a list of all participants in these matches) to lead this flyover survey of Nyroth. If Ionia prevails, it will be conducted by Piltovian airship; if Bilgewater wins, by one of Zaun’s zeppelins. Summoner Sodaman64 will represent Bilgewater, while Summoner Purple Bavarois will represent Ionia. Summoners from each faction may vote below as to which Champion they’ll send. hmm why is it so automatic that bilgewater would go with zaunite zeppelin? Bilge technically won the week, so we get the zepplin.